Out of this World: Science Fiction but not as you know it is the British Library’s first exhibition to explore science fiction through literature, film, illustration and sound and opens next month, running until September. 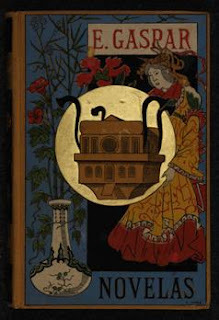 The Library tells us "it will challenge visitors’ perceptions of the genre by uncovering gems of the Library’s collections from the earliest science fiction manuscripts to the latest best-selling novels." Guest-curated by Andy Sawyer, Science Fiction Collections Librarian at the University of Liverpool, the exhibition will trace the development of the genre from True History by Lucian of Samosata written in the 2nd century AD to the recent writings of Cory Doctorow and China Miéville, showing how science fiction has turned from a niche into a global phenomenon. Events include appearances by several British comic creators including Alan Moore and Neil Gaiman. Here's a full list of all events. A short series of discussions exploring the cutting edge thinking and scientific research and ideas that may determine the kind of future we will have on earth. This is the thinking that may seem like science fiction but will be revolutionary in our lifetimes; although it is not without controversy. Leading scientists, theorists and writers share their thoughts. 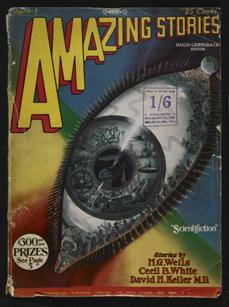 the world’s first science fiction magazine. Copyright © The Estate of Frank R. Paul. Who owns the story of the Future? Compared to this, the Industrial Revolution was nothing! Fixing the Planet: have we finally got some concrete options? The Age Of Entanglement: are we too intertwined with technology? 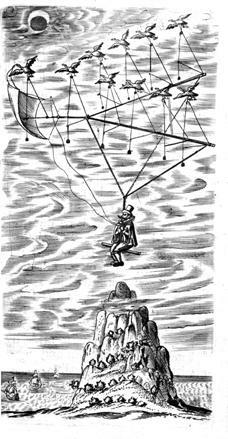 The Man in the Moone. 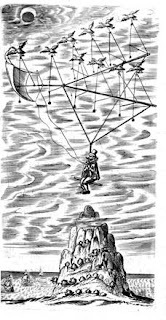 From the first edition, 1638.
known portrayal of a time machine. A truly great European writer, Stanislaw Lem (1911-2006) transcends both Polish literature and his chosen genre, science fiction. Best known for his twice-filmed novel Solaris, he was a virtuoso storyteller who packed his writing with philosophy, comedy, and allegory. This evenings rich centenary celebration features contributions by writers John Gray, Toby Litt and Wojciech Orliński, and film makers Ari Folman (currently filming Lem’s The Futurological Congress as follow up to Waltz with Bashir) and The Brothers Quay. Chaired by journalist and critic Rosie Goldsmith. Plus more ‘Out of this World’ events in September to be announced. The Library's exciting season of events continues in the final weeks of the Out Of This World exhibition. In September, the British Library welcomes best selling author Neil Gaiman, alongside other greats of science fiction and beyond. Further events will be devoted to the exceptional writers J G Ballard, Robert Holdstock and others. • Out of this World: Science Fiction but not as you know it runs from 20 May – 25 September 2011. Tickets for all events are available at http://boxoffice.bl.uk, by calling 01937 546546 (9am-5pm Mon-Fri) or in person at The British Library. The Book: Dreams and everyday life is about 'the important things' in life. Not careers, health, wealth, or social status, but rather the innumerable everyday, human situations and defining experiences of daily life. From choosing the right clothes to wear, to whether to pick up a hitchhiker; from mobile phones, parties and restaurants, to learning a martial art, expressing your inner thoughts, and suicidal cacti (of course!). 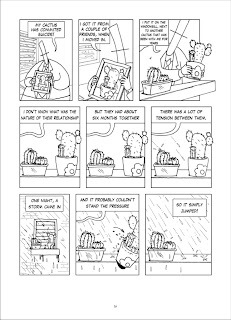 The book is comprised of three separate but interconnected stories that tackle everything from the mundane necessities of everyday life, to the profound musings on technology and the future; all in a comic, whimsical, poetic and philosophical way. Although Aviv has drawn deeply upon his own life and experiences, having grown up in one of the world's most troubled and intense regions, he has produced a funny, poignant and wonderfully humane graphic novel, with truly universal appeal. The Review: Tabella, a small UK publisher, are fast building an eclectic but enjoyable list of graphic titles. 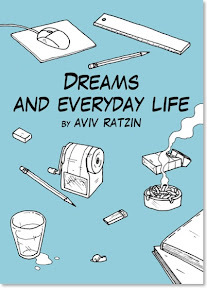 Aviv Ratzin's intriguing insights on modern life, as his character evades real work and explores our strange modrrn world, is the latest, offering a marvellous, insightful take on relationships and the daily trials and tribulations of modern life. Favourite elements must surely be Reuven, the hitcher who becomes a permanent resident in the protagonist's car; the vicious cacti that brook no usurper plants on his window sill; and the vampiric bats hanging from his apartment ceiling, devouring all income as fast as he makes it. And if that isn't enough to intrigue you, then one final chapter - a savage commentary on how we are fast cocooning ourselves from reality in a bubble of social media personas and falsehood - is definitely worth a read. Aviv Ratzin, professional animator, illustrator and guitarist, has conjured a delightful concoction of worldly observation here which, for just £7.99, is well worth checking out. Continuing Panel Borders month of shows about collectives and anthologies, the team have a recording of a panel discussion from Sci-Fi London in 2010, celebrating the continuing popularity of the iconic British Space Hero Dan Dare, whose first appearance in The Eagle was published in April 1950. Comics editor and writer John Freeman (The Science Service / Ex Astris) talks to a quartet of artists and writers who have created new adventures for the lantern jawed pilot in more recent years. Rod Barzilay, the then editor and one of the writers of Spaceship Away, the officially licensed Dan Dare magazine that has continued the original adventures of Spacefleet where the 1950s Eagle left off over the past decade. 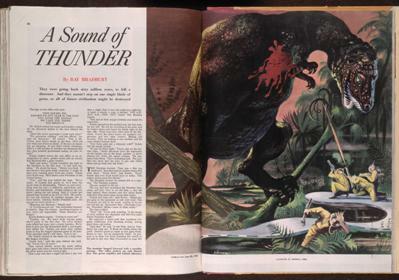 This recording covers Dare's appearance in print from the 1950s to the 1980s. (Recorded and edited by Alex Fitch). Where are you going to be on Saturday 31 March and Sunday 1 April 2012? The chances are that many of you will be in Inverness - whether you know it yet or not. Hi-Ex organisers Vicky Stonebridge and Rich Clements have announced that, after a year off, the Highlands International Comics Expo will return in 2012 with the fourth Hi-Ex taking place over the April Fool's weekend at its regular venue of the Eden Court complex on the banks of the River Ness in Inverness. With Scotland still to experience the first Glasgow Comic Con in June, the third Oxfam Comics Day in Edinburgh (probably in late summer) and the fifth Dundee Comics Day at the end of October, Hi-Ex may seem a very long way off but with the second Cardiff comics expo announced for February, 2012 is already shaping up nicely for comics conventions. Considering the Saturday night at Hi-Ex now traditionally involves taking over an all-you-can-eat Chinese restaurant in the early evening followed by an all out assault on the convention bar until the wee small hours in an attempt to drink it dry, Sunday morning 1st April may prove to be an interesting experience. There are more details of the Hi-Ex convention on the Hi-Ex website and blog. 'Train-Flight', published in Issue 159 - 161.
sum of £40 per issue as an 'appearance fee'. It is with great sadness that downthetubes must report the death of Actress Elizabeth Sladen, best known to millions as Sarah Jane Smith from Doctor Who and, more recently, The Sarah Jane Adventures. I had not spoken with Lis for years but dealt with her on many occasions while editor of Doctor Who Magazine, often to sort out agreed payments for the use of BBC photographs in the title, but she would occasionally call and ask advice on approaches she had had from fans asking her to events and so forth. I always found her kind and generous in spirit but, like her on screen character, very firm about what she would and would not do, and getting what she wanted - but always with great kindness. 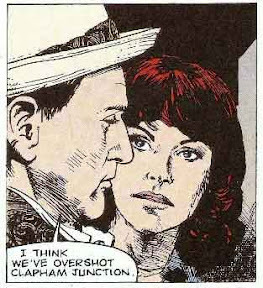 An example of this was the permission she gave for me to use her likeness in one of the first Doctor Who comic strips I actually edited, Train-Flight. She will be much missed and my heart goes out to her family and many, many friends. I know she will be much missed. Here is the official BBC statement on her passing. It is with much sadness that we can announce Elisabeth Sladen, the much-loved actress best known for her role as Sarah Jane Smith in Doctor Who and CBBC's The Sarah Jane Adventures, passed away this morning. She was 63. Lis first appeared as Sarah Jane in Doctor Who in 1973 alongside the Third Doctor Jon Pertwee and stayed for three and half seasons working alongside Jon and the Fourth Doctor Tom Baker. She returned to the role on numerous occasions over the years and, in 2007, was given her own spin-off series on CBBC - The Sarah Jane Adventures - where she would appear alongside new Doctors David Tennant and Matt Smith. The Sarah Jane Adventures brought Lis a whole new generation of fans who grew up to love her alien-busting adventures. The series was hugely popular with fans young and old and won this year's RTS Award for best children's drama. Controller of CBBC Damian Kavanagh said tonight: "I'm deeply saddened and shocked by the news of Lis' untimely death. Lis brought joy, excitement and a sense of wonder to her many fans in her role as Sarah Jane Smith. She was adored by our young audience and I know all of them will miss her as much as I will." The creator of The Sarah Jane Adventures Russell T Davies said: "I absolutely loved Lis. She was funny and cheeky and clever and just simply wonderful. The universe was lucky to have Sarah Jane Smith; the world was lucky to have Lis." Steven Moffat, Doctor Who's Lead Writer and Executive Producer said: "'Never meet your heroes' wise people say. They weren't thinking of Lis Sladen. "Sarah Jane Smith was everybody's hero when I was younger, and as brave and funny and brilliant as people only ever are in stories. But many years later, when I met the real Sarah Jane - Lis Sladen herself - she was exactly as any child ever have wanted her to be. Kind and gentle and clever; and a ferociously talented actress, of course, but in that perfectly English unassuming way. "There are a blessed few who can carry a whole television show on their talent and charisma - but I can't think of one other who's done it quite so politely. I once showed my son Joshua an old episode of Doctor Who, in which Lis appeared. "But that's Sarah Jane," he said, confused "In old Doctor Who. From years ago. How come she always look exactly the same?" It's not a comfort today, of course, but children will still be saying that fifty years from now." Keith Jones, Director, BBC Cymru Wales, said: "The Sarah Jane Adventures has been one of the most successful children's programmes on television in recent years - and without Elisabeth Sladen it would not have happened. A brilliant presence on screen and on set, she brought the excitement and energy of the Doctor Who family of programmes, of which we are very proud at BBC Wales, to a whole new generation. She will be missed by all at BBC Wales who worked with her." Roger Carey, who represented Lis for many years, said. "She was not just a client, but a dear friend. She was so positive about life and her natural energy was intoxicating. She couldn't believe her luck when her career was resurrected in her own series." "Sarah Jane dead? No, impossible! Impossible. Only last week I agreed to do six new audio adventures with her for Big Finish Productions. "She can't be dead. But she is: she died yesterday morning. Cancer. I had no idea she was ill; she was so private, never wanted any fuss, and now, gone. A terrible blow to her friends and a shattering blow for all those fans of the programme whose lives were touched every Saturday evening by her lovely heroic character, Sarah-Jane Smith." "It is widely agreed that the best ever actor to play Watson to the Doctor’s Holmes was Elisabeth Sladen"
Cancer research UK is a cancer research organisation which is largely kept running through the volume of its volunteer supporters. The organisation seeks to run large charity campaigning events in order to give cancer and the need to cure it a high profile among the public. Another large charity which provides nurses to those in pain from cancer and in need of looking after. The charity aims to make their life more comfortable and improve its quality, and supports over 1000 nurses. Put on your apron, dust off your mixing bowls: it's competition time and National Family Week is looking for a cooking hero - who could win a VIP pass to the Batman Live Arena show when it tours the UK this sumer. National Family Week and French’s Mustard are on the hunt for the nation’s favourite family BBQ recipe - whether that be a delectable dip, a gorgeous grilling recipe or a sensational sauce - and they'll reward the winning chef and their family with an all expenses, VIP trip to see the Batman Live World Arena Tour in the UK. All you need to do is design a grilling recipe that the whole family can enjoy using everyone’s favourite, French’s Mustard. The recipe must take no longer than 25 minutes to prepare and be ready to serve, totally original to you and never published (full rules here). It can be anything from a vegetable dip to a main course. Be as imaginative as you like, just as long as it’s tasty! When you’ve created your recipe, upload it here on the National Family Week web site, along with a photo of your prepared dish. 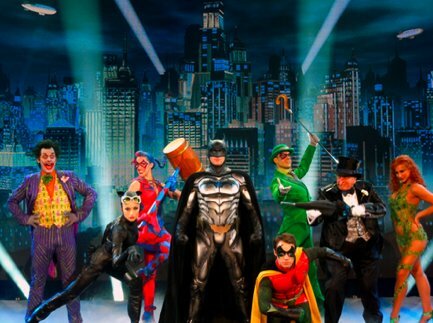 The winner of the best dish as chosen by celebrity chef Antony Worral Thompson, will experience the VIP treatment courtesy of French’s to see “The Batman Live Stage Show” at any of the UK arena venues with a night's accommodation. The show will incorporate all of the trappings of the Batman universe: Batman and Robin, as well as butler Alfred, will battle many of the iconic villains such as The Joker, The Riddler, Catwoman and The Penguin in a new, original storyline created for the show. Five Runners-up will receive family tickets to the Batman Live Stage Show at any of the venues across the UK, while each and every entrant will be sent a tube of French’s mustard. 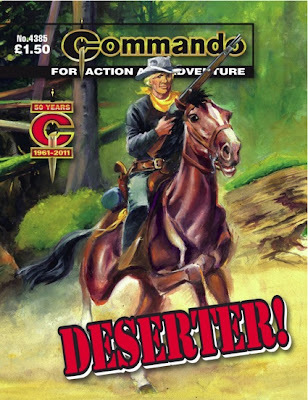 Matt Badham wrote "Deserter! ", a story for DC Thomson's Commando title back in 2008, which has just been published in Issue 4385 - giving you some idea how long some scripts can take to get into print. I don't feel very comfortable referring to myself as a writer, even though I've been professionally published since 2006. During that time, I've written articles for publications such as the Judge Dredd Megazine, Tripwire, Comics International and the Big Issue in the North, and scripted for 2000AD and Commando Picture Library. (NB: That last statement is slightly hyperbolic. I've written one five-page strip for the former and one issue of the latter.) If you asked me to name some writers, I'd probably mention the likes of Arthur Conan Doyle, Alan Moore, William Goldman, Warren Ellis, Connie Willis (my absolute fave) and Paul Cornell, and it seems wrong to place myself in such esteemed company. But I do write and I'm paid to do so. I suppose, therefore, I am a writer, whether I like it or not. And I do, mostly… like it, I mean. So, writing my Commando was largely uncharted territory and particularly hard work. But it was enjoyable and I think I learnt a few new lessons about writing. What follows is the process as I remember it. 'Abraham Brown's older brother Robert went off to serve in the Army of the North in the American Civil War… and he didn't come back. Abraham followed in his footsteps grimly determined to avenge his brother's death. Deserter! is one of the few ideas I've had that popped into my head fully formed. I knew who the main protagonist was, had an idea who would make up the supporting cast, and had a firm beginning, middle and end. And I had what I still hope is a cracking twist that sends the whole story off in a new direction, just as the action seems to be winding down. And let's stop there for a moment, because there's a valuable lesson here for any aspirant writers out there. Tip One: if you want to be taken seriously as a professional writer, obtain and read the submission guidelines for the publication you're pitching to and follow them. Editors are busy people and your job as a freelancer -- and I think it was Rob Williams (2000 AD, Cla$$war, Wolverine) who said this -- is to make their lives as easy as possible. If there are no guidelines, then study several issues of the publication rigorously before submitting your work to them (actually, you should also do this even if there are guidelines). The first draft of my Deserter! synopsis was written up as a 1000-word document and submitted to editor Calum Laird by email, as per the Commando guidelines. And it was rejected. But Calum made some positive noises and suggested I re-write it. You see, I'd committed what I believe is a common mistake amongst novice Commando writers. The story was fine, as were my characters, but there just wasn't enough plot. Tip Two: if you're pitching to Commando, you need to remember that this war comic eats plot and incident. I mean… devours it. And then, with its belly bulging and its belt buckle loosened, has the temerity to ask for second helpings. This is because, as noted by others elsewhere, the title is more novelistic than most comics, with a compressed storytelling style that relies a lot on captions to convey action. In fact, Commando, in my opinion, has almost as much in common with an illustrated book as it does with other comics. And so I set about re-writing my synopsis, incorporating Calum's suggestions along the way (he'd given me some ideas as to how to 'fill' my plot out a bit). Tip three: the editor is King (or Queen). As I've already noted, I write articles for the Judge Dredd Megazine. I used to fret a lot about what was being written about my articles online, in terms of feedback from the readership. Then, one day, I had a sudden realisation. It's not my job to worry about what the readers want. That's the role of my editor, Matt Smith. And he's the guy that I, ultimately, should see as my 'audience'. He's the one I should worry about pleasing. And writing for the Megazine has been a much less stressful experience since I had that realisation. The second synopsis was accepted and I went ahead and wrote the script. That was in 2008 and it's only now that Deserter! is on the news-stands. It's been quite refreshing reading Deserter!, as, although I remembered the bare bones of the story, I'd forgotten the specifics. The comic is definitely a 'ripping yarn' peppered with if not 'anti-war' statements, then a few 'severely-ambivalent-about-war' moments. The thing is, though, most of the (good) stories told in Commando aren't, to me, about war, even though if you removed that element they would probably need severe re-jigging to work. Let me try and explain that a little bit better. "[They'd be] awfully badly typed and there’d be misspellings with little handwritten corrections. It was messy. He made mistakes. He had all sorts of silly phrases he used. But the core of his story, every story, came down to people. "He had observed people his entire life and because his stories were so good from that point of view, you could ignore the bad spelling and the various other bits and pieces, because that’s what a sub-editor’s job is there to do, to make sure everything is all right. Obviously, it’s much better if it comes in properly written but if you’ve got a writer whose stories are good enough, then you’re prepared to make an allowance for that. "Whereas you get other people, their stories come in and are beautifully set out, spelt, punctuated, adequate stories, the whole thing and somehow it’s soulless. So, it’s up to writers to push the envelope a bit here and there to make their stuff different from everyone else’s." Deserter! is on sale now. Should you happen upon a copy and read it, then I'd love to have your feedback. Addendum: I've since had four story ideas for Commando go belly-up on me at different stages of the submission process. It remains to be seen whether Deserter! was a fluke. Hellblazer writer Jamie Delano will be making a rare public appearance in the UK this weekend at in London. For those who don't already know, John Constantine: Hellblazer, published by DC Comics, centres on a magus who investigates occult crimes, hauntings and disasters. Originally a secondary character introduced during Alan Moore's revolutionary Swamp Thing run, Delano was the title's original writer, chosen by Alan to continue John's adventures, and established the character in his own right, fleshing out what had been, in Moore's hands, a more shadowy, wisecracking sort of figure. It was also Delano who set the character firmly in London, Moore (and, later, Rick Veitch) preferring to present him travelling virtually anywhere at will. Delano's Constantine is very much flesh and blood, never using magic when a con will do, frequently drunk, down and out, and haunted by his accidental condemning of a little girl named Astra to hell. Joining Jamie on stage are artist David Lloyd, who contributed to the comic and illustrated the Constantine graphic novel, The Horrorist; and two of the most recent contributors, Andy Diggle and Peter Milligan. 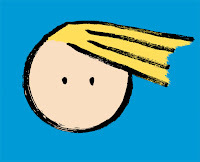 "As far as I know this is Jamie Delano's first appearance at a British comics festival in many years," says event organiser Alex Fitch, "and apart from a last minute addition to the Kapow! line-up, the first that Peter Milligan has done in a long time also. No-one else has put both of them and David Lloyd and Andy Diggle on the same panel." The discussion will be followed by a screening of the film adaptation of the comic, Constantine, starring Keanu Reeves. The event is just part of Comics@Sci-Fi London, curated by Alex Fitch from Panel Borders, the UK’s only radio show about comics, celebrating British comic creators from the last 30 years in The Blue Room at BFI Southbank, which includes appearances by creators such as Lee O'Connor, Ian Edginton, Al Davison, Tom Humberstone and many more. (via Nick Abadzis and Forbidden Planet International): I missed this great news last week but make no apologies for plugging now. Comic creator Nick Abadzis has announced Blank Slate Books will be publishing a collection of his hugely popular strip Hugo Tate, which first appeared in Deadline magazine alongside Tank Girl and other well known indie strips. 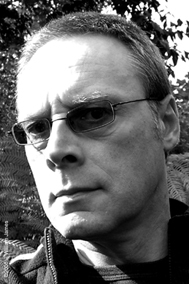 Hugo Tate ran in Deadline magazine from 1988 to 1994. Part of it was collected as Hugo Tate: O, America in 1993 and in 1994 this collection won a UK Comic Art Award for best graphic novel. "But this is to let the faithful out there know that the Hugo Tate book really is on its way. It’s going to be published by Blank Slate, an imprint whose output I’ve been really enjoying in the past couple of years." It's hard to explain in a couple of sentences what Hugo Tate is about exactly, but he was a stick-man who, as he acquired experiences during the run of the strip, slowly evolved into a more figurative character. It's the sort of visual metaphor that could only work in comics. Blank Slate has been putting out some great indie titles: most recently, Luchadoras by Peggy Adam, chosen as part of the 2007 Sélection Officielle at the Angouléme International Comics Festival; and Sleepyheads by Randall C. It's easy to see Hugo Tate alongside these and other company's many other titles - it's a perfect fit. • Click the strip images in this story to view some of Nick's favourite pages from Hugo Tate - or just click here to browse them all. The Book: Mind reeling from recent events in The Boys (told in the 'Believe' arc), Wee Hughie heads home to Auchterladle - the semi-idyllic Scottish seaside town where he grew up. All Hughie wants is some time to himself, to return to the bosom of family and friends, and get his head together after two years of unimaginable chaos - wondering whether he should leave The Boys or not. But our hero's luck has always been more cloud than silver lining, and the familiar surroundings he craves are not all they might be. 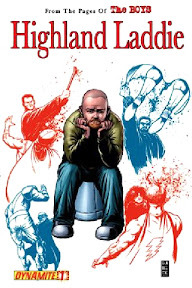 The Review: Collected by Dynamite in the US, now publishers of The Boys comic, Titan Books are distributing the UK edition of the creator owned series, written by Garth and normally drawn by Darick Robertson, which was originally published by Wildstorm before moving to Dynamite Entertainment, apparently after DC Comics expressed unease at the anti-superhero tone of the work. The series is set in a contemporary world very much similar to the real one, with one notable exception: a number of people have some form of superpower. The series follows a superpowered CIA squad, known informally as "The Boys", whose job it is to keep watch on superheroes and, if necessary, intimidate or kill them. It's 2000AD artist John McCrea who provides the art on this 'quieter' story, as Hughie takes stock of his life by going home, only to have the kind of violence that has punctuated his daily life follows him here. Garth mixes in some great quirky 'normal' characters into the story (normal being a giant transvestite called Big Bobby and Det, a man who smells so badly he and his family have to wear gas masks); and Hughie is forced to come to terms with his relationship with his super powered ex-lover, whose guilty secrets have been revealed, forcing a wedge between them. While the story has an adventure/mystery bubbling away in the background (smugglers dealing drugs laced with Compound V, or "Blue", which can grant some superpowers, permanently if taken pure), it's Hughie's story that's the focus of the tale. In that sense, it's an unusual Ennis tale (of those I've read), perhaps far more character than action driven than what you'd expect. Garth delivers a great story, with some genuinely moving moments and carefully building on what readers already know about Hughie and Annie. Of course, British comic fans can't fail to spot the homage to DC Thomson's 'Oor Wullie' - not just in the collection's cover art, but Hughie's old friends Big Bobby and Det are surely plays on Oor Wullie's friends Fat Boab and Soapy Soutar. 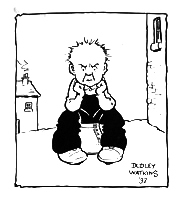 As Bleeding Cool's Rich Johnston noted last year, Hughie’s parents, Paw and Maw, are modelled on Oor Wullie’s parents in the strip and Hughie's East Coast home town is called Auchterladle – Oor Wullie lived in Auchenshoogle. Garth's angst-filled script is complemented by some great art from John McCrea, particularly in key 'flashback scenes' (the one involving Hughie's strange aunt is positively creepy) and the 'talkie' scenes, notoriously hard to make interesting in comics. John delivers with aplomb, in my view. No ordinary 'Boys' tale, then, but still hallmark Ennis, delivered with just the right mix of trademark violence and a fine dose of spirited characterisation. Not normally a title I'd have picked up, but I thoroughly enjoyed it. The new issue of Jeff Hawke's Cosmos has just been released with its usual selection of complete stories from artist Sydney Jordan's Daily Express strip, detailed background notes on the strips themselves as well as other articles. Volume 6 Number 3 features full length reprints of the Jeff Hawke strips Overland from 1966/1967, Cataclysm from 1968 and The Bees of Daedalus from 1971 complete with introductions written by Sydney Jordan and Hawke's Notes on each strip written by Duncan Lunan. Editor William Rudling provides a Hawke's Wings factual feature on the Woomera rocket range in Australia that features in some of the Hawke strips while Andrew Darlington's Space Heroes feature covers DC Thomson's 1950s character Nick Swift Of The Planet Patrol who featured in Adventure beginning in March 1952. 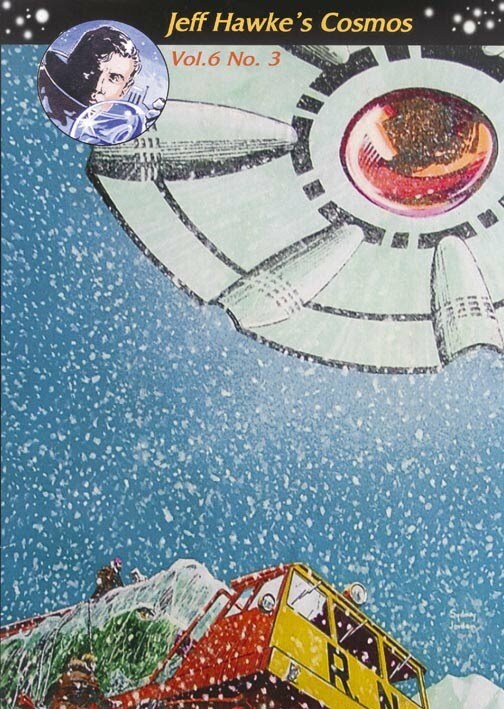 After six years of continuous publication Cosmos is rapidly coming to the end of the original Jeff Hawke strips and there has been some debate as to whether the magazine will continue with Jordan's follow on strip Earthspace. This featured the similar character of Lance McLane and was syndicated in some newspapers as Jeff Hawke. Editor William Rudling tells us that he has decided to continue Cosmos with the Earthspace stories and, having read some of them recently, we here at downthetubes can say that Hawke fans will not be disappointed with them. Attendees at next month's Bristol International Comic and Small Press Expo will be able to see copies of Cosmos as William Rudling will have them there alongside Jeff Hawke's creator Sydney Jordan who will have original Jeff Hawke art boards for sale. Jeff Hawke's Cosmos Volume 6 Number 3 is available from the Jeff Hawke Club. The subscription rate for Volume 7 is £22 for UK members which provides three issues of the 88 page, A4 magazine and access to the back issues and specials that the club has previous published. There are more details on the Jeff Hawke Club website. 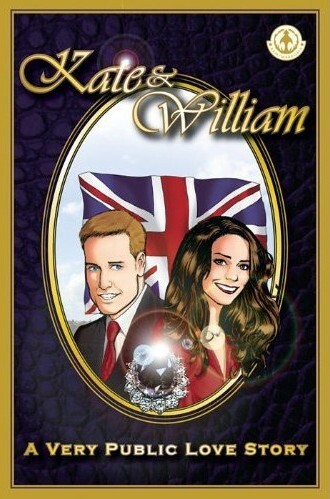 At the time of writing the royal wedding is less than two weeks away and Markosia's Kate and William: A Very Public Love Story written by Bleeding Cool's Rich Johnston and illustrated by Mike Collins (on the bride's side) and Gary Erskine (on the groom's side) has hit the shops. It also looks like finishing the book was not the end of wedding bells for Gary as he is now on extended leave from the Scotch Corner art blog to attend the wedding - not the one in London however but his own which is rather further away. We wish Gary and Mhairi all the best (and William and Kate as well, of course). Staying with Scotch Corner, blog founder and artdroid Graeme Neil Reid has opened an online shop for his work. Named Original Scribbles, the shop features both artwork and and the type of sketches that Graeme features on his blog I Got No Work Done Today Because... and also sells at conventions. Artwork currently available ranges from Doctor Who to Ghostbusters and Battle Picture Weekly to Marvel superheroes. Graeme will be at the Macintosh Church on 18 June as one of very few non-Glaswegians to have a sales table at the Glasgow Comic Con, along with Gary Erskine and quite possibly the majority of the rest of the Scotch Corner artists. Staying north of the border and with an election due just after the royal wedding writer Mark Millar has nailed his colours to the mast and unsurprisingly they are tartan. Millar is backing the Scottish National Party and endorses its leader Alex Salmond who's claim to fame (from a comics point of view) is that he has appeared in The Broons. We can only assume that Mr Salmond does not endorse 10 year old female vigilantes roaming Scottish cities. And finally our best wishes for a speedy recovery go to Lew Stringer over at Blimey! With his work appearing in the current issues of Dandy, Toxic, BeanoMAX and Viz Lew should be recovering from a celebration rather than an illness. Thanks for the kind words mate - now hurry up and get better otherwise where are we going to read all the latest behind the scenes happenings on British humour comics? Eagle Times, the journal of the Eagle Society, reaches its 24th year of publication with three articles on British artists - from original Eagle, cutaway artist Hubert Redmill and the rather better known Brian Lewis, plus from new Eagle, Dan Dare artist David Pugh. 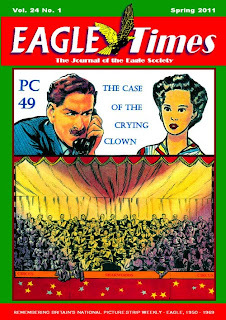 Eagle's link with 1950s radio are covered with the beginning of a new text story adaptation of PC49's radio adventure The Case of the Crying Clown and the transcription of one of the Radio Luxembourg's Dan Dare episodes sponsored by Horlicks. In addition to these, and showing that Eagle Times does not cover just Eagle comic, there are articles on the comic strips Gun Law from Express Weekly and Sammy In Space from Swift as well as a heavily illustrated piece entitled Ron Embleton's Lovely Ladies ranging from the demure Maid Marion from Tell Me Why to the rather less demure Wicked Wanda and Candyfloss from Penthouse. Eagle Times Volume 24 Number 1 is 54 colour and B&W A4 pages. the magazine is published quarterly and the annual subscription for 2011 has been held at the 2010 rate of UK £23 and Overseas £34. There are more details of Eagle Times and the Eagle Society on the Eagle Times Blog.